These simple and sophisticated red drop earrings are ideal for day or night. You can wear the red earrings to add a hint of colour to your work outfit, to dress up a casual outfit or accessorize more formal attire. 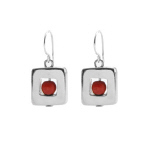 Scandinavian by design, the red earrings feature a silver-coloured square with single red wooden bead.